I’ve been really dragging my feet with this guest room. It has been almost done for months and honestly every time I go to take pictures of it someone is in it! The newest finished project (well, sorta) here at StoneGable is a room that was my son Christopher’s. Again we gutted the whole thing… ripped out carpet, installed new hardwood floors, painted the entire room, upcycled or shopped the house for all the furniture. And bought new bedding! Abby, Chris’ wife of two years was my inspiration for this room. Because it really still is Chris’ and now Abbys’ room when they are here I asked sweet Abby how she would like me to decorate it. 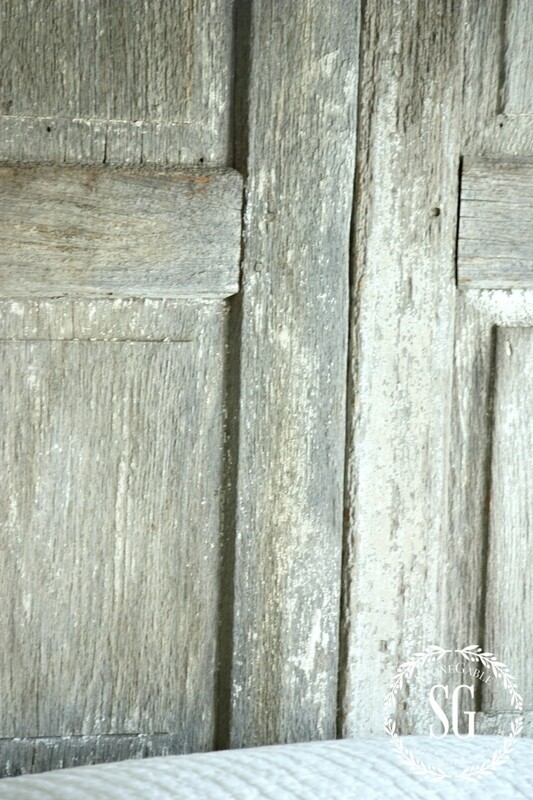 She is a chippy, shabby chic, country, vintage, no-pink, burlap and texture kind of a girl. So I chose a color palette of soft blues, whites with a whisper of gray and some very neutral tones. The newest room to be made over now has a relaxed, sweet dreams feel. This is one of 5 bedrooms at StoneGable and the smallest of them all. It has a very cozy feel with lots of light coming from the double windows. The walls are Silver Mist by Valspar. It’s a really soft comforting color. A little more blue than gray, which is perfect for me. I like gray… I just could not live with it. Bobby made the headboard out of some old local shutters we picked up at my favorite local antique haunt, THE ANTIQUE VILLAGE OF STRASBURG. We cleaned them up and sealed them and Bobby put them together and bolted them to the wall. I love love love their chippy look! 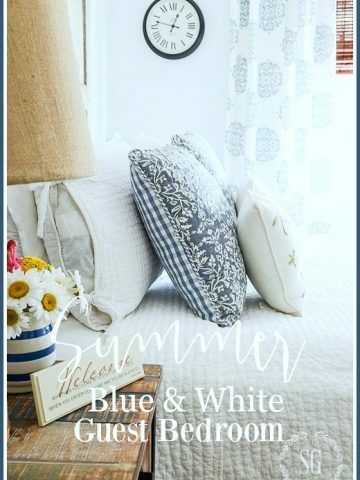 The white cover, white pillow shams, blue and white striped duvet and blue and white striped pillow shams came from our local Pottery Barn Outlet. 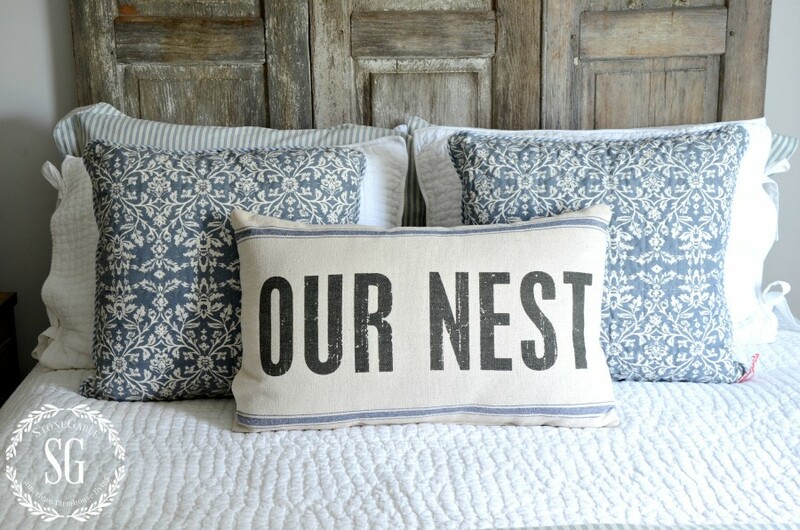 The pillow with the blue and white stylized floral print came from HERITAGE LACE and the “OUR NEST” came from a local barn sale. I found this great vintage looking mirror at my local Pottery Barn Outlet (on sale) and the robes (on super sale) hanging on it too. I also found these light gray geometric curtains at the PBO! Yes, I like the PBO! The big basket is for tossing all the throw pillows in when my family or guest are ready to crawl into bed. It came from HomeGoods. I like HomeGoods too! Can you see the beautiful sign with the words to the hymn TAKE MY HEAR AND LET IT BE? I won that in a giveaway! YEA!!! 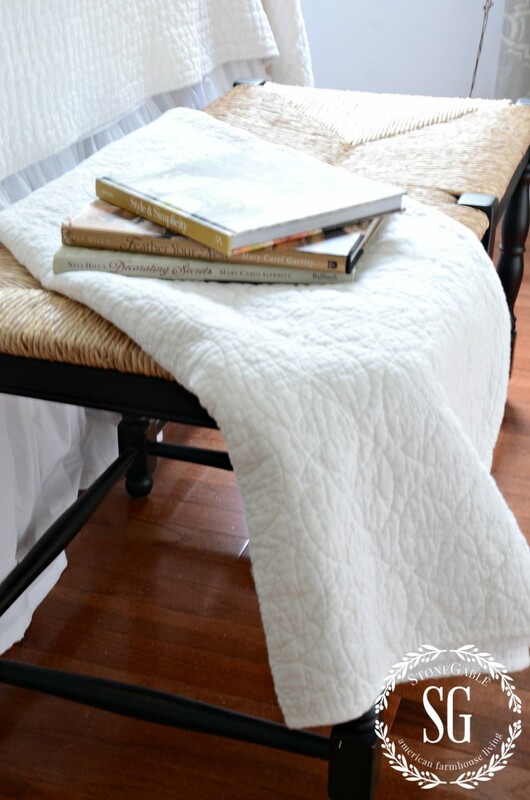 A rattan bench with a white coverlet and some decor books sits at the end of the bed. I think I’ll paint this bench a softer color to work with the room! Probably Annie Sloan Paris Gray. This comfy chair came from Joss & Main. It was in the foyer, but I like it better in this room! I just couldn’t help adding a couple of pillows to it! I’ve had this chest of drawers for about 30 years and it was really a mess. It’s amazing what a couple coats of paint and new hardware can do!!! TOTALLY different look! If you would like to see how I transformed this once ugly duckling and step-by-step directions, click HERE. Thanks you Sue for making this sweet little bird for me! I could not wait to display it! A-dorable! I still have a few pieces of art to hang on the wall and I’m looking for a new rug for the room. Are we ever REALLY done decorating a room? I think rooms should keep evolving! And I’m sure this one will too! Remember to pin this to your Pinterest DECOR or BEDROOM boards. You can follow me HERE and see all the great things I am finding to pin daily! I have a birdie themed guest room! This reminded me of it! I still need to get a tray in there before my weekend guests arrive..that tip was just a great suggestion. Perhaps a water carafe and a small vase of yard flowers? Love your blog! I also have the same question as Dee-how did your husband hang the shutters? Have found some door panels and want to do the same. French cleat and raise them above the baseboard to keep them flush to the wall? Or has he devised another method? This room is a great inspiration. I LOVE the color on the walls – and I may get a sample to see how I like the color in my son’s bedroom. Where did the “Take my life” artwork come from? OK,Yvonne, I have your next business…airbnb!! 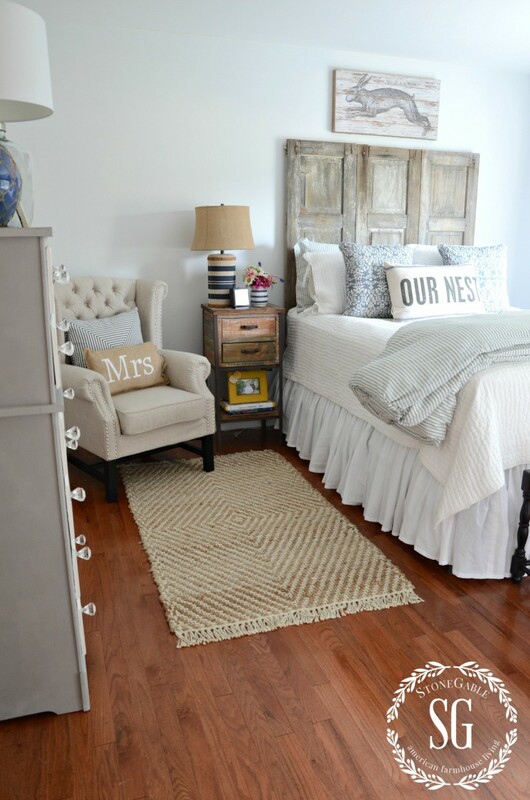 Wow, your guest room for Chris & Abby is absolutely gorgeous! I love everything you’ve done, the colors, the linens, the headboard, the furniture, it all looks so beautiful. Wish I also had a PBO near me. Well done Yvonne, it’s a fantastic bedroom. Your daughter-in-law is one lucky girl. Love it all! My two favorites are the Hymn sign and the blue striped lamp. It is all put together in such a welcoming fashion. Where did you find the lamp? Beautiful room and so relaxing looking, too, Yvonne! With your gift of hospitality, I’m thinking you may need to think about a Stonegable B&B! Your sign with the hymn printed on it, would you mind telling me where you got it? That hymn was sung at our wedding 30 years ago so that’s very special to me. Yvonne: What a beautiful, peaceful room. Love all the choices that you have made. Oh, dear friend, I can see why this room is difficult to photograph. . .
I’m sure your guests don’t want to leave this gorgeous Guest Room!!! 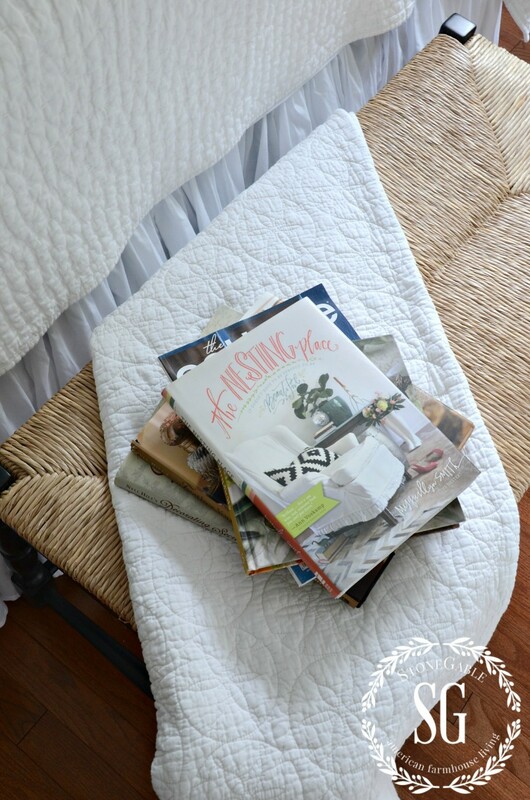 The perfect size, the perfect bedding. . .and such a tranquil and serene hue!!! 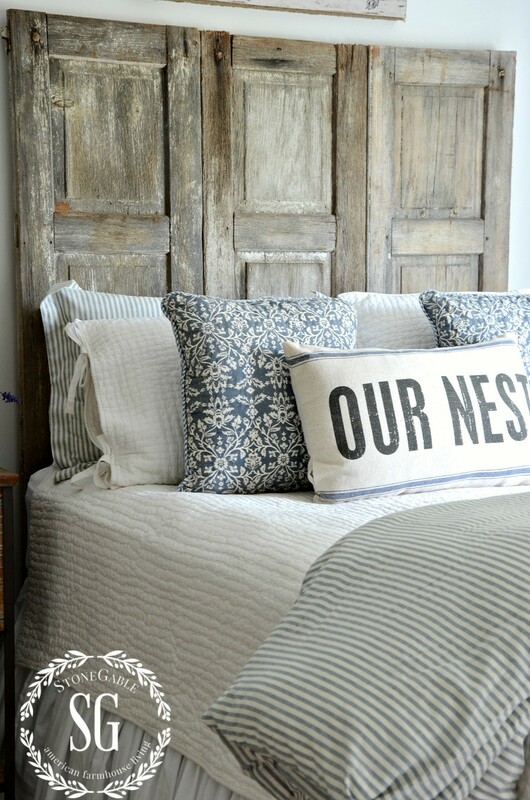 I adore the headboard made from shutters!!! Love, LOVE, L O V E that you found such “great finds” at $ale prices!!! Thank you for sharing this “dreamy” space with us!!! I agree, totally. . .decorating is never quite “finished”!!! I absolutely just love everything you do Yvonne! You are truly an inspiration! It doesn’t matter that I don’t have a PBO near me because I don’t have an eye for design like you do. That’s why I love that you share your beautiful ideas with all of us! I wish I could hire you to decorate my home! Thanks again for sharing, your pictures are like a work of art to me. The room is wonderful, Yvonne! Love the colors and accessories. Love, love this! I am just redoing a guest room right now. Loved it so much that I went to Lowe’s to try and buy the Silver Mist paint from Valspar. But they said there is no paint that color and even looked through the discontinued names. Yvonne, could this be another paint company by chance? Sorry Karen, Maybe it was Sherwin Williams. Try that! Oh Yvonne, that room speaks to me! It says, “Welcome! Come in, kick your shoes off and feel the calm. Relax, cozy up and enjoy.” … BTW, do you take reservations? Ha Ha! Seriously, I do love all your details and I wouldn’t change a thing! I love your sense of style, and reading your posts is one of the highlights of my day! 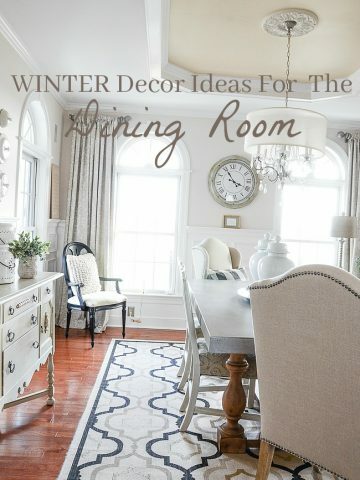 Oh it is a beautiful room Yvonne….I am sure your son and daughter in law just feel so warm and cozy in this room. Love all of the beautiful details and the mirror with the hooks are just perfect for the plush robes!….What a treat for guests!….and love the way that gorgeous architectural piece fit in the room!…..Beautiful job Yvonne….have a fabulous weekend and hope you had a great birthday! I love everything about this room. It’s fresh, cozy and charming. 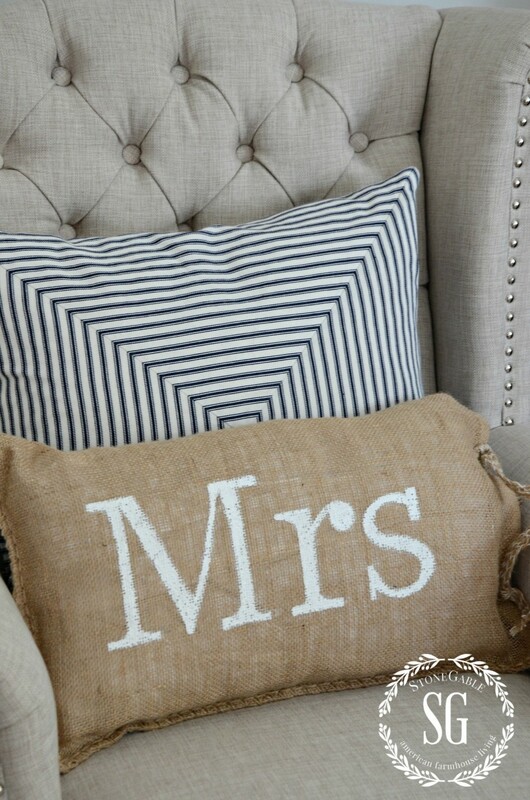 But my favorite thing is the “Mrs” pillow which shows the love you have for your very lucky daughter-in-law. Your guest room looks very inviting Yvonne! So warm and cozy! Your son and daughter-in-law are lucky to have such a pretty room to stay in. I agree with the comment about not having a Potters Barn outlet here in CT. Maybe we will someday. Love Love the “calm” of room… Outstanding!!! 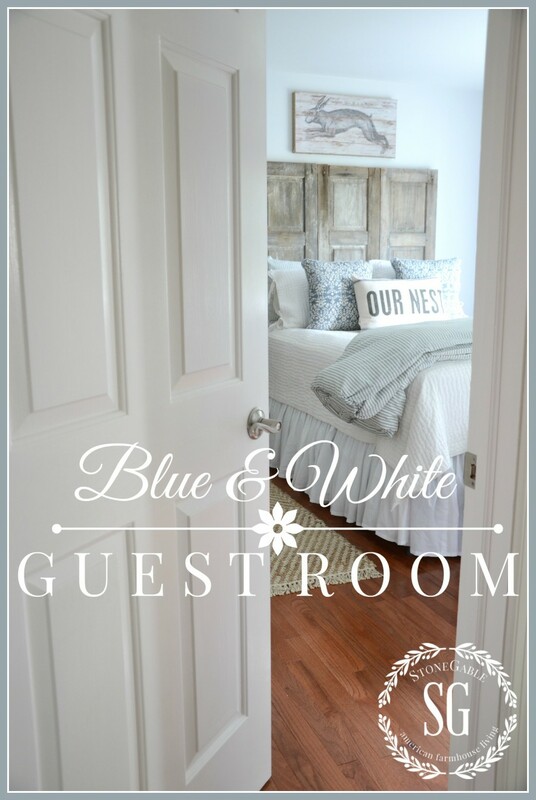 I love this guest room and your great blog, thanks for taking the time to write it. 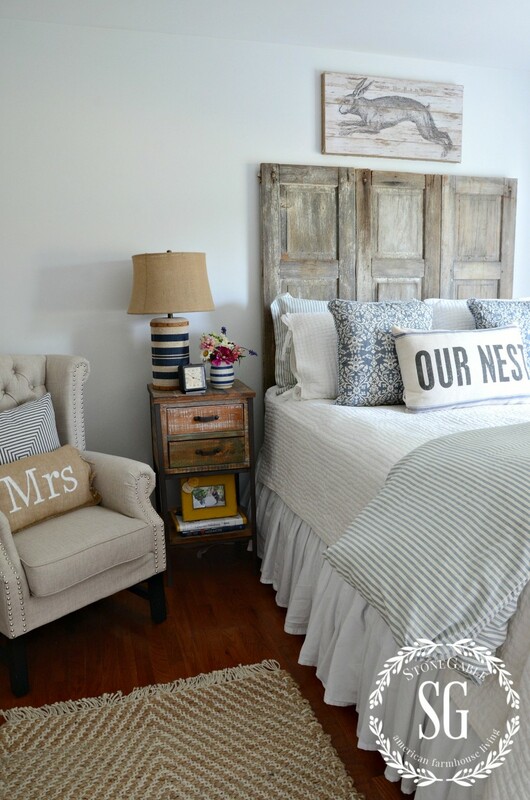 I also just love those shutters and have been wanting to do something like that but was worried about old paint and the grandkids, what did you use to coat them? Thanks and have a wonderful weekend. Beautiful! Anyone would feel welcomed and relaxed staying in your guest room. Love the headboard, it is perfect with the bedding. Such a beautiful room to welcome your guests. You did an amazing job! 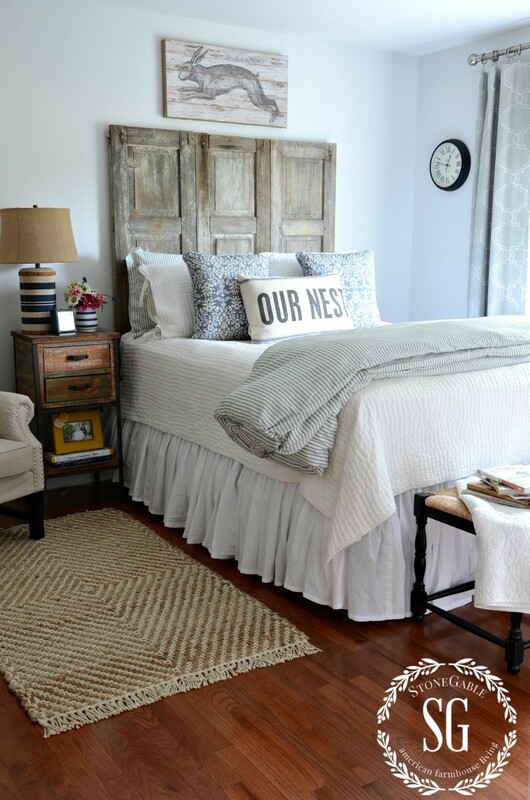 Love your guest room make over. Looks so relaxing….I too wish there was a Pottery Barn Outlet here close by. Love, Love, Love. The sign you won, (Lucky you), where is it from? I love it all, especially the headboard and calming colors. Perfect for a bedroom. Wish I had a PBO! Two of my very favorite things in this beautiful room are the mirror w robe hooks and the little framed bird. Precious. And the rug and bench add contrast and texture that’s good. I just finished and posted my Master redo and I first committed to it in February by announcing that I was doing it. The finish is worth the wait though…your guests will appreciate it too. I painted our master bedroom/bathroom Silver Mist two years ago. I love it! 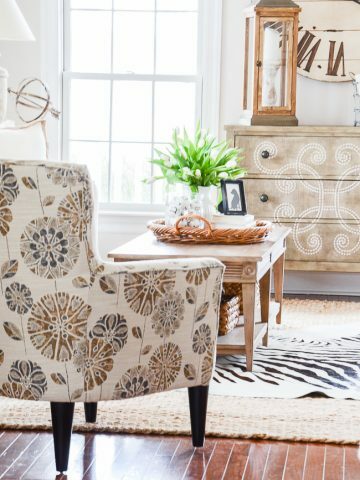 It gives a real ‘beachy’ feel to the room. Ours is a Sherwin Williams paint, though. 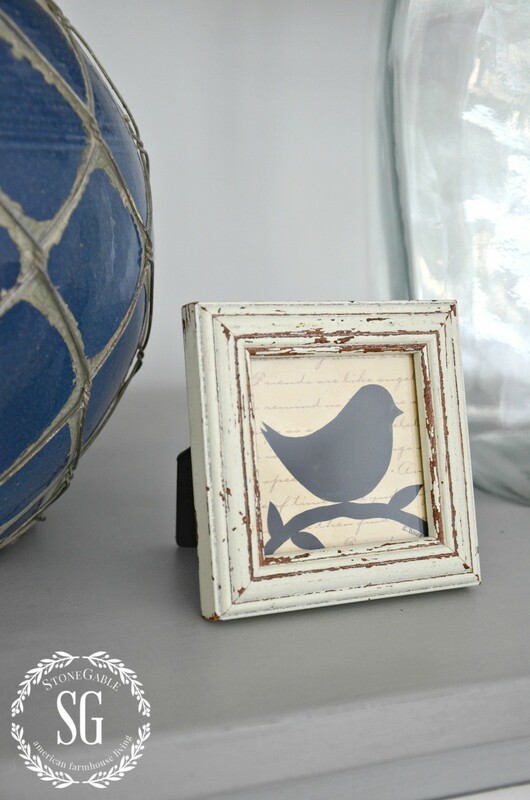 I would love to know how she made the bird in the frame!! Love it and the room!!! Great room with great texture and I love that little bird. Any chance of a free download? Hi Melissa, It was a gift from a friend. Great idea for a tutorial though! It turned out wonderful Yvonne! I love the soft color scheme and the headboard is amazing! WOWOWOW….. Just beautiful… VERY VERY welcoming!!!!!!!! Taking reservations by any chance???? lolol…. Great job! What a beautiful and inviting room….so soft and comforting! I just love the blue with the neutrals. Love love love the headboard. Makes me shutter with delight. love it. two thing I would leave the bench black because the chair and end table look like they black and is there a end table on the other side of the bed ? I do not have Home Goods or Pottery Barn and it makes me sad every time someone says they got something from there. I love this room, but I’m with Angela here. The darker finish really helps pull the wood around the room and keeps it flowing. I think with it gray, the space would feel lopsided. It also helps ground it. Love the old with the new and all of the great finds. It’s so much fun watching your makeovers Yvonne. Love all the ideas you share. What a thoughtful mother/mother-in-law. The room is beautiful. LOVE it Yvonne!! I am sure your daughter in law loves it, too. 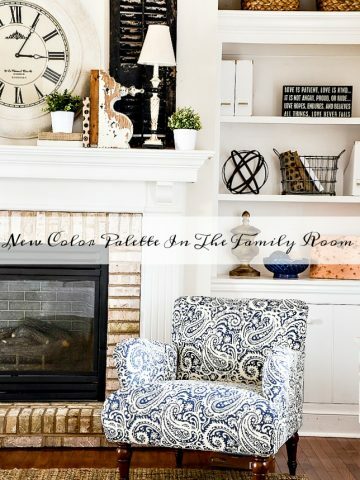 What a beautiful space Yvonne, and the color palette will be timeless. I think your guests will be very happy in that room! Beautiful room, Yvonne! I know that Christopher and Abby love staying in it when they come to visit. Pinned to my “Inspiring Decor” board! Lovely! You had me at blue and white! Love . . . . I love it!! I always like to read the special touches you place in your guest rooms. 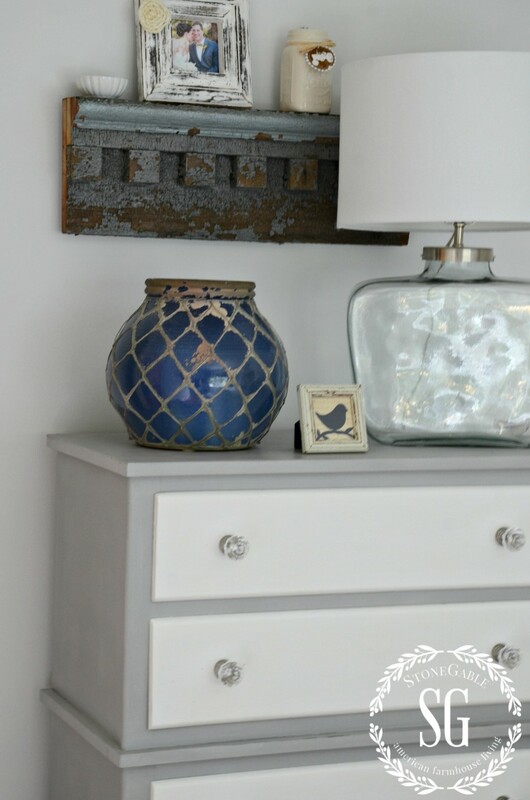 The blue/greys in the room are very restful — I like the grey and white you painted the chest of drawers! My heaven — five bedrooms!! I could sneak over there and you’d never know I was there. I would just switch from room to room 🙂 I’d bring my own food. Where did you find the rabbit above the bed? What a beautiful, calming room. Any guest would be happy to stay there. What cozy, welcoming room! I love the dresser and the rabbit over the bed! Oh my, what a lovely room. I love everything about it and especially the headboard and wall art. 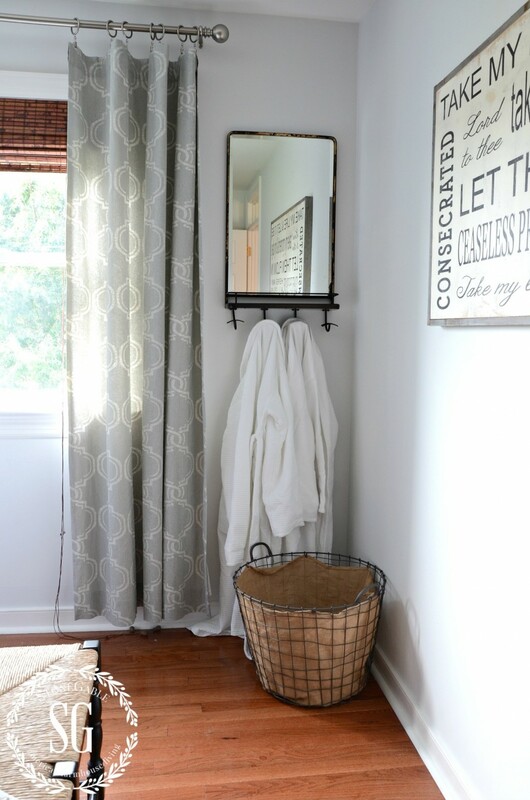 I also like the idea of the mirror with hooks and cozy robes and basket. Yes, I love it all!! 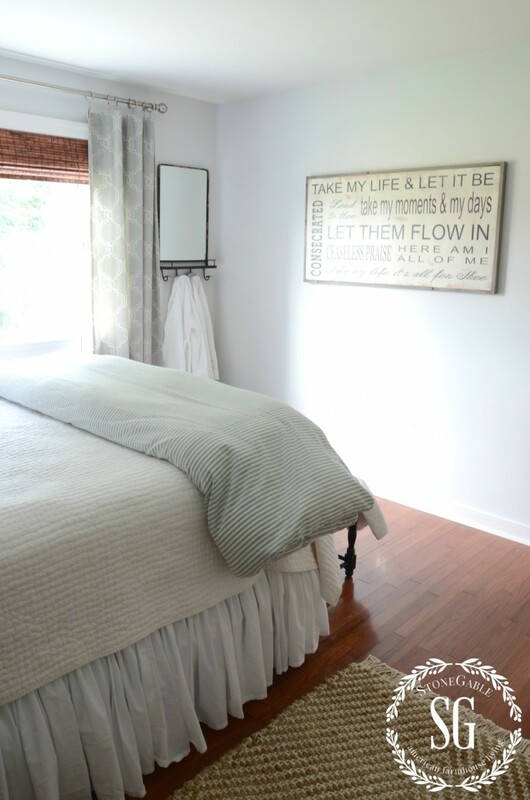 What a beautiful, comfy looking bedroom, Yvonne…..love the simplicity and calming colors. You’re amazing! Beautiful job. I just found a white, quilted spread at Christmas Tree Shop for $30………couldn’t resist but didn’t really have a place in mind. Now, I know what I’ll do with it thanks to your inspiration.